These Monkey socks will likely be my first FO of the new year. 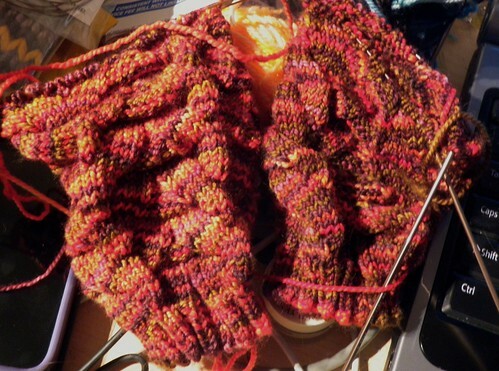 As far as my knitting goals, I stuck to my 1/3 yarn diet – buying only 1/3 as much yarn as I knit / destashed. 1. Continue the 1/3 stash goal, but this year be better about not buying new yarn until *after* I have the “credit” for it (instead of buying and then catching up*). 2. Knit at least 24 pairs of socks, plus other things. 3. Finish items until I only have 6 WIPs left, and keep it that way. Casting on a bunch of new things at once is fun, but it means that some projects get set aside and take forever to finish. * I’d gotten off to a pretty good start by not joining any sock clubs for 2011, but then I made an exception for Cookie’s new club. I have already subtracted the 600g (approximate for 6 skeins of sock yarn) from my stash total for this year and will “pay it off” before buying anything new.